Sinohydro denied accusations it used unsafe construction methods to build Malaysia’s Bakun dam. Nonetheless, it acknowledges that its construction processes it implemented was not in accordance to correct procedures. 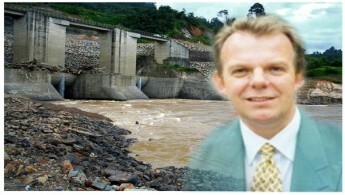 Torstein Dale Sjotveit, the Norwegian boss of Sarawak’s privatised electricity monopoly, Sarawak Energy Bhd, has alleged that European environmentalists protesting against mass displacement of Sarawakian natives are against “economic development”. In an interview with radio station BFM aired yesterday in the Klang Valley and parts of nearby states, Sjotveit attacked the NGOs for defending the land rights of natives displaced by the Bakun and Murum dams. Damn the Dams — They only make the First Family richer!! Batang Ai is more often than not associated with the hydro electric dam that supplies electricity to other places outside of Batang Ai, such as Kuching. The Sarawak Chief Minister of donkey number of years had just confirmed in public that there will be 12 more dams in Sarawak. Same old developmental arguments are used. The dam projects will benefit the people of the area and of course of the state’s economy as well blah blah blah. Of course what is not mentioned in the public domain is the development of the personal wealth of family members and cronies.